The Dong Kam School Food Garden is a small green initiative to provide a sustainable food source for Dong Kam school students in Kalasin Province. It started as a model project to demonstrate skill building activities for students but became a community bonding experience for the local people as well. To date, project members, consisting of teachers, students and locals have built many environmentally friendly mini-projects. Locals were trained to build mud houses to reduce costs. A small vegetable garden was also started. Then teachers installed a soil-cement brick making machine and a bio-gas processor to help locals do sustainable work on their own. Chaiyapruk Foundation is a charity children’s home based in Nakorn Nayok, founded by Dr. Cleopandh Soorapanthu and her husband Dr. Somsak Somsugdi. The home is a three- story facility where 46 children are currently adopted. They take care of abandoned children and provide basic needs along with educational opportunities. 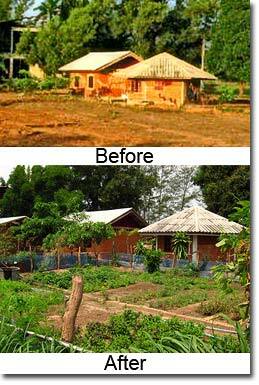 In 2004, the foundation undertook an expansion project aimed at improving facilities and starting a self-sustaining food garden for its own needs. The founders, with help from a group of international consultants led by Sepp Holzer built a system of dikes that doubled as an aesthetic sign that spelled “”LOVE~PEACE” over the property. This project was expected to convert into a garden/fruit landscape. More dikes were built for flood protection. Miniature rain forests were also planned. A bakery training center/ canteen was put up to help children learn vocational skills at Victory Tree Children Home. The project is supported by donations from international churches, schools and volunteers, along with help from the National Commission on Sustainable Development (NCDO). In the future, the bakery is expected to turn into a small profit center. This project is aimed at producing organic farming products for sale. Chaiyapruk Foundation needs volunteers to help assist with taking care of the children’s basic needs and tutoring the kids with their homework. Volunteers are also needed for maintaining the home, gardening and harvesting. Donors can help boost fundraising efforts for scholarships, sponsorships for new orphans and sustainable project investments.